Today I broke down and rented a scooter. Only 115cc. Automatic trans. I was quite nervous about doing this so soon for the simple reason that they drive on the left here. It takes time to get used to this as a pedestrian, let alone as a driver with other very big machines hurtling along around you. Being a pedestrian is pretty dangerous in itself. There are few actual crosswalks (not that they would increase anyone’s safety), very few timed lights and you do NOT have the right of way. This ain’t California. You step off the curb, you take your life in your hands. Yesterday I stepped off a curb looking left instead of right and almost got hit by a scooter. I also don’t know my way around. There is nothing intuitive about the layout here, not to mention that the city is also a maze of one-way streets with medians that cannot be crossed, limited U-turn availability, alleys that do not go where you think they are going. If you take a wrong turn, you could literally be taken miles off course before you have a chance to recover. Trust me on this. Might say it’s worse than Boston. And Siri doesn’t work in Thailand and I wouldn’t be looking at my phone while driving anyway. But there is no mass transit (maybe that’s why I’ve barely seen any clear sky since I got here). 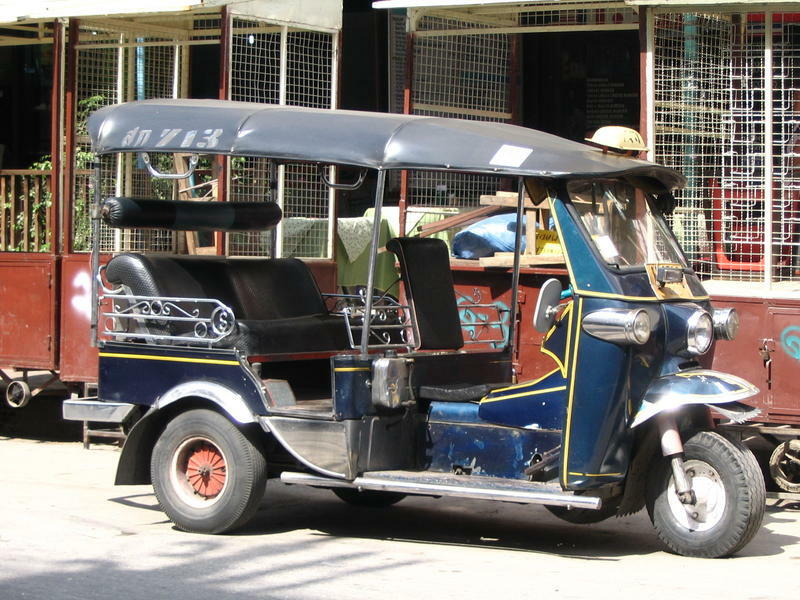 So if I wanted any mobility at all other than hiring a tuk-tuk all the time, I needed a scooter. I was surprised at how quickly I got the hang of it. Navigating the side streets, narrow as they are, is fine. You don’t have to go fast, there’s less traffic. The more congested streets are another story. 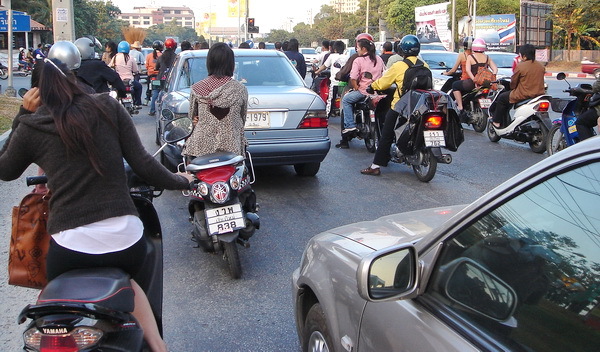 Masses of scooters and motorcycles are threading their way through traffic, between cars at stoplights, collecting at the front, waiting for the lights to change and then launching en masse, swarming across the intersections. There are few street signs that I’ve noticed, no curbs on some of the main streets and what might pass for a sidewalk is actually a riding zone for scooters that aren’t participating in the motocross of the center lanes. That’s where you’ll find me. Shops are densely packed along the roads, a blazing collage of signs, bikes and cars. It’s all quite confusing if you don’t know where you’re going. You can’t see how many are wearing masks. But you can see how many are not wearing helmets. The center of the city, the old city surrounded by a real moat is less than 2 miles square from what I can tell, is the dense tourist and ex-pat zone packed with guest houses, hotels, hostels, cafes, all forms of restaurants, chic bistros down narrow lanes tight for one car, trendy boutiques with attractive wear at very moderate prices, temples, galleries, historic sites, travel agents, scooter rentals, bars, lounges of every stripe, open air craft markets, food stalls. You name it. In-Tense. Not much parking. All walkable. Unfortunately, there is also an abundance of hawkers wanting to sell you tours, zip-line BS, treks, river rafting–every form of Empty Doing you can imagine. By that I mean it is mere stimulation that has nothing whatsoever to do with the cultural depth of Thailand. It’s like a sugar high that fades quickly and isn’t really nourishing. River rafter might be another story, but only if direct participation is encouraged. The elephant tour, however, is de rigeur. Me? I’m headed for the snake farm outside the city. Anyway, many guest houses do attempt to create a sense of retreat within the close quarters of the old town by creating enclosures, surrounding their shaded courtyards with tropical foliage, walls, well-designed and very appealing common spaces and eating areas. Initially, I never considered being in that area, but I have since reserved a room for several weeks in a western area of the old city near one of the largest temples. Now that I have a scooter, I can start exploring out of town, up into the mountains and out to a couple of parks, as well as along a very popular 80km loop ride. Everything is new of course. But despite the fact that this city is very alive with culture, commerce, diversity, culinary treats, history and hospitality, I can already feel how I will need to temper the pace in the slower and simpler ex-urban landscape. Plus, stop eating so much exhaust. I’m getting a mask at 7-Eleven right away. The absolute coolest thing I’ve done yet was visit the Bank of Thailand Tribal Museum. It’s actually quite small, but is situated in a very modern complex surrounded by gardens. 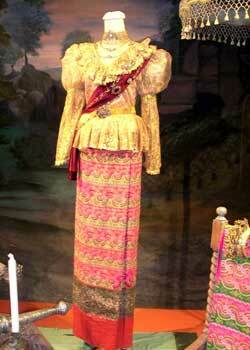 The museum itself is devoted only to textiles and the history of money (Bank of Thailand?) in the La Na Thai-Shan-Khmer territories. The finely embroidered textiles are stunningly beautiful in their design, intricacy and color. But NO photographs were allowed. So what I am showing you here are actually pale comparisons. One of the more amazing styles of weaving was done solely by women as a buddhist religious labor to accumulate merit and insure themselves a fortunate rebirth. Women were excluded from monastic life. They had no opportunity to become monks. There is precious little online to demonstrate the exquisite beauty and intricacy and religious symbology of these pieces, But they were used as garments, hangings in temples and to wrap ceremonials texts. Try this link. Scroll down to the bottom and click on the Khmer ceremonial hanging. That’s as close as I can get. This entry was posted in Personal, Travel and tagged Bank of Thailand, chiang mai, Chiang Mai pollution, Khmer textiles, Old Town, traffic, Tribal Museum by garyhorvitz. Bookmark the permalink. A fascinating account! Your descriptions make the experience very vivid and immediate and the idea of you tooling around on a scooter is delightful. After you paint the picture of the density and complexity of Chaing Mai, the mental image of you becoming more fluidly mobile within it (and able to scoot outside of it sometimes) is unbeatable. Thanks for telling your tale! Please continue! So I shall, dear J.There are already quite a few priceless moments to relate. Sawat dee, Khun Gary! William here of GPS and, as you may recall, a former Peace Corps Volunteer in Northern Thailand. I once spent a lot of time exploring Chiang Mai, as you are fortunate enough to be doing right now. Try to find a Khao Suay shop in the older part of the City, not far from the Ping River, and quite near a Moslem Temple. Outstanding Khao Suay, a noodle dish that I hope you’ll enjoy as much as I do. Sawat dee, William. So good of you to join me here. I know Khao Suay to be a Burmese concoction, almost a national dish, but spelled differently. But around here, however you spell it, it’s probably just as good. There are so many places to check out, each neighborhood seeming to have a character all its own, it’s difficult to choose where to go each day. But it’s all fun and getting even more fun as I feel a little more confident about getting around band tasting the many flavors here.